The founder of Radha Beauty® is Rebekah Letch, who created this brand in 2014, with its offices in Northvale, New Jersey, USA. Her Indian heritage (she had Indian parents although raised in Singapore) exposed her to traditional oil baths where oil mixtures provided nutrients to her skin and hair. This practice stands as the sole aim of her brand which believes elements of nature can maintain beauty. The non-toxic products from this company come from natural sources thereby enhancing your natural beauty. Radha Beauty sources its oils from around the world from nature’s leaves, nuts, seeds, and fruits. They work with the global farmers ensuring sustainability, quality, and purity. Radha Beauty has no links with Multi-Level Marketing (MLM) which makes its products budget friendly. The brand also does not dilute or cut any of its products which are listed below. 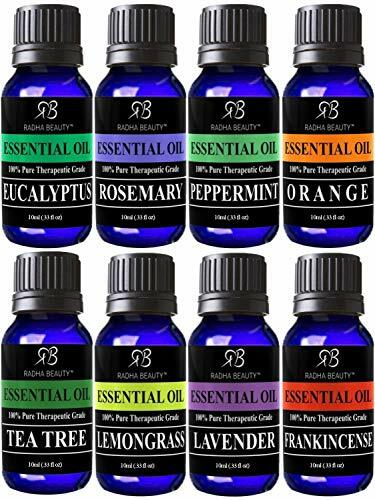 These oils come in 4 ounce (120ml) dark blue glass bottles. These bottles have droppers which make the dispensing of oils easier. 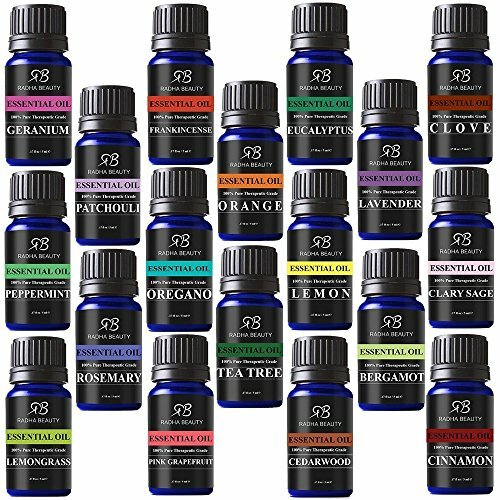 The oils do not contain any bases, fillers, additives, and carriers of any kind. This pureness makes this product ideal for use with your diffuser, thus making you enjoy the immense benefits. These benefits can help with dry skin, cold, flu, and other related symptoms. This set of oils comes in 8 fragrances which include Rosemary, Lemongrass, Peppermint, Lavender, Orange, TeaTree, Frankincense and Eucalyptus. Another perfect match for your diffuser, this set has various uses in making beauty products, candles, cleaning, and aromatherapy. You can find these oils in 0.34 ounce (10 mL) bottles. This set can serve as a perfect gift for your loved one. Here are the benefits of each oil contained in this set. Orange : Orange has an exciting soft fragrance perfect for fighting a case of the blues, lifting your spirits and stops spasms. Orange oil can also promote sexual desire, help your body with the removal of toxins and equally act as a sweet soothing relief. Research also shows that the compounds in this oil also help with inflammation. Peppermint : Helps stop pains in your stomach, and calms your anxiety and lifts your spirits thereby improving your mood. Lavender : Another ideal oil for relaxation and calmness, its light notes brighten your mood and also soothes the pain. Lemongrass : Lemongrass oil makes you feel relaxed and focused. It also soothes muscles aches; fights bacteria and germs; enhances your energy levels, and even drives bugs away. Eucalyptus : This oil helps to fights the common cold and breathing problems. It also soothes inflammation; relieves nasal congestion and even repels bugs. Frankincense : This oil helps with sleep problems such as insomnia. Like earlier mentioned oils, it can also calm you down after a stressful day. Rosemary : Helps with dry and oily skin. It also supports hair growth. 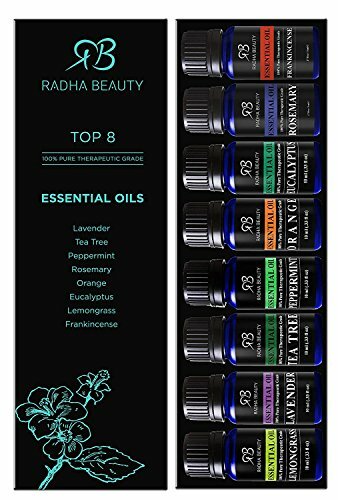 This Radha Aromatherapy Set of 8 includes a cool mist ultrasonic diffuser which can hold about 4 ounces (120ml) of water. The water which requires 2 to 5 drops of oil before use. The diffuser can cover an area of 2000 sq ft with great fragrant mists that will calm your senses. This item has LED lights and an auto-stop function which allows it to go off when empty. Radhas cool mist diffuser serves as an ideal choice for use in the home, office amongst other places. The set poses as a great gift for loved ones. You can use the single oils or mix and dilute with a carrier oils before a massage. Radha beauty goes further to serve you by offering gift wrapping services and also a manual included in the pack. Furthermore, if you notice any problem with the item, feel free to demand a refund without returning the product. No questions asked. As a fast growing brand, Radha Beauty has branches in most parts of the USA and other parts of the world. If you wish to become a supplier of the products, you can check them out. We believe our support will be of great help to you. Now let us see how Radha Beauty creates its oils. Our virgin essential and carrier oils come directly from natural sources such as fruits, leaves, nuts, and seeds. Radha has a good partnership with farmers and other health bodies across the world. This sole aim is to encourage premium grade oils and sustainability. Radha Beauty procures the above plant material for steam distillation. This process involves the injection of steam into a sealed still at intense pressure and temperature. It gradually breaks down the plant material and extracts its volatile parts. These parts rise into a condenser and cool into a concentrated liquid. Other features which undergo testing include specific gravity, refractive index, flashpoints, optical rotation, solubility in alcohol amongst others. The final step includes the packing and the assigning of lot numbers to the items. The brand applies extreme care during bottling and labeling with the use of cutting-edge technology. 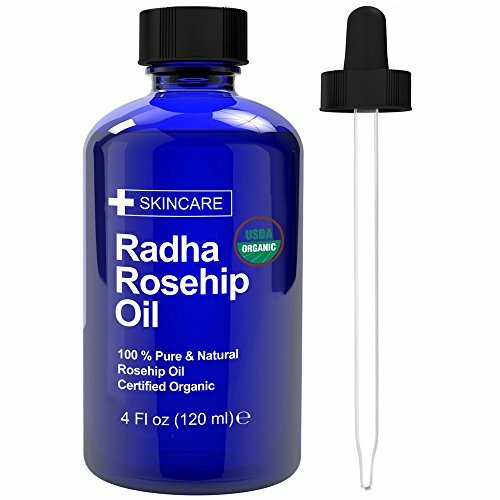 Radha Beauty ships its products across the globe and provides premium services to its consumers thereby helping with their desire to lead healthy lives. Radha Beauty, the brainchild of Rebekah Letch, stands on the belief that offers better alternatives in beauty products. This idea has origins in the founder’s discovery of traditional practices such as the use of oils enhanced her skin and hair. 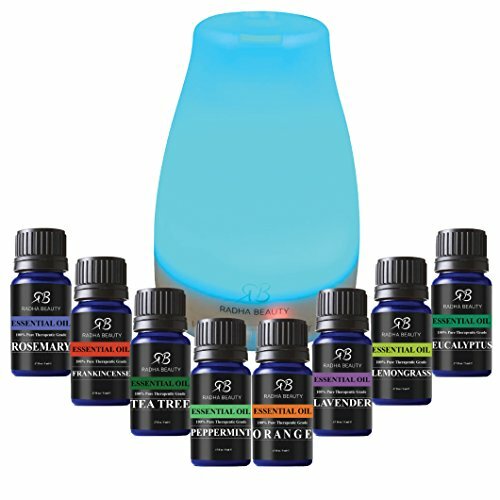 With this in mind, the brand launched a line of pure essential and carrier oils in various fragrances that provide many benefits to its users. The brand also has excellent after sales service and offers to ship to all parts of the world. Next articleHow to Make Essential Oil Perfume Last Longer ?